Requesting a light and bright kitchen with professional-grade appliances, as this homeowner did, isn’t unusual. But there’s nothing formulaic about this Glen Ellyn transitional kitchen design, which makes use of unexpected details such as pops of bright blue in a coffered ceiling and a dark wood bar top with an elegant edge. The footprint of the original room mostly unchanged, borrowing a modest amount of space by repurposing an under-utilized laundry room/walk-in pantry/desk. Mirrored door panels further add to the airy feel and reflect color from an outside garden area. 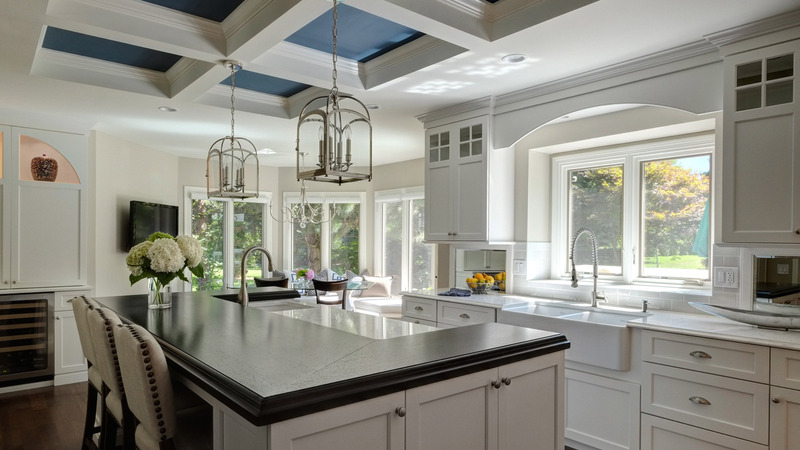 This kitchen was featured in the 2013 Glen Ellyn Kitchen Walk.